I’m not going to lie, computerized machines intimidate me. I see an embroidery machine and I get nervous. All I can think of is about what if I break the Motherboard? What if my tension is off? 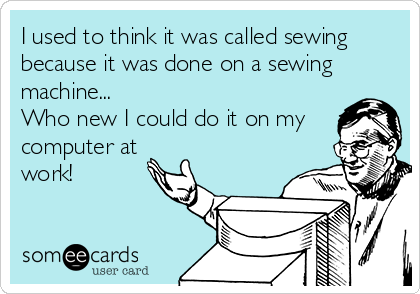 What if it only sews backwards? I’m terrified! I look at the machines surrounding me in my room and I know that if one of them has something wrong with it, I can take it all apart and put it back together. (Trust me, I’ve had to do it to some of them.) I can take apart the thread tension disks and put them together. I can take apart my bobbin case and adjust the thread tension there. I can clean the gears, I can buff the needle plate. I can do it all… to a mechanical machine anyways. At work I see the embroidery machines, which are beautiful pieces of art, and I love to play on them! I made that shoe bag, and then I did some embroidery samples at work. They are fun and amazing! However, I’m worried about owning one. Now in all reality, I could never justify the price of one to do what I do. I don’t do crazy quilts, and however much I think embroidery is amazing, I probably would not do it professionally. I just don’t see myself owning one. ← Anyone Know What These Feet Are?